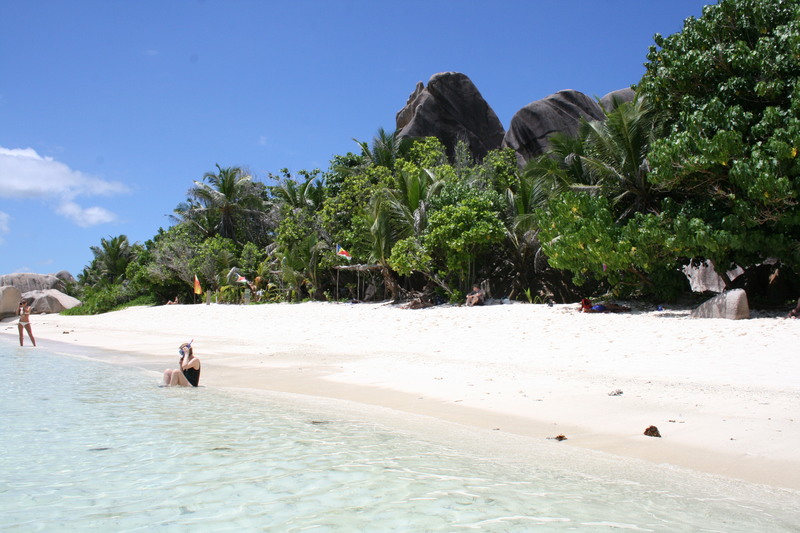 There’s one must see on La Digue (Seychelles): Anse Source d’Argent. If you see a picture of the Seychelles the probability that it’s this beach is quite high. Located in a nature park it costs 100SR (approx. 8€) to get in. Preferably by bicycle, as the way from the entrance to the beach takes at least 3minutes. In our traveller mind a nature park is a bit different from a Domaine where Vanilla is planted. Nevertheless: It’s like this, one rides through the Domaine on sandy streets until he reaches the beach. There the bike has to be left. We haven’t locked it, as everyone rides anyway his bike and stealing on such a small island won’t be very successful. The small sandy track leads through stunning nature with palms overhanging the beach surrounded by granite stones. It is like wandering through a miracle world. Always the thought in my mind: This cannot be real! It looks like in a movie. On the way there are small snacks to get like coconut milk or fruit salad. Amazing that even the fishes in the water know that this is paradise! Big fishes swam around us, eating all our biscuits which we shared with pleasure. I don’t need to add that our kids were fascinated like hell. The sea there has nearly no waves because it is surrounded by a reef. 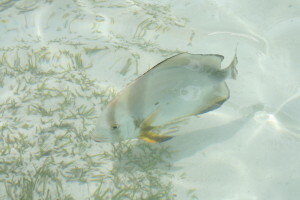 Many people go there for snorkeling as there are sometimes turtles and colourful fishes to be seen. 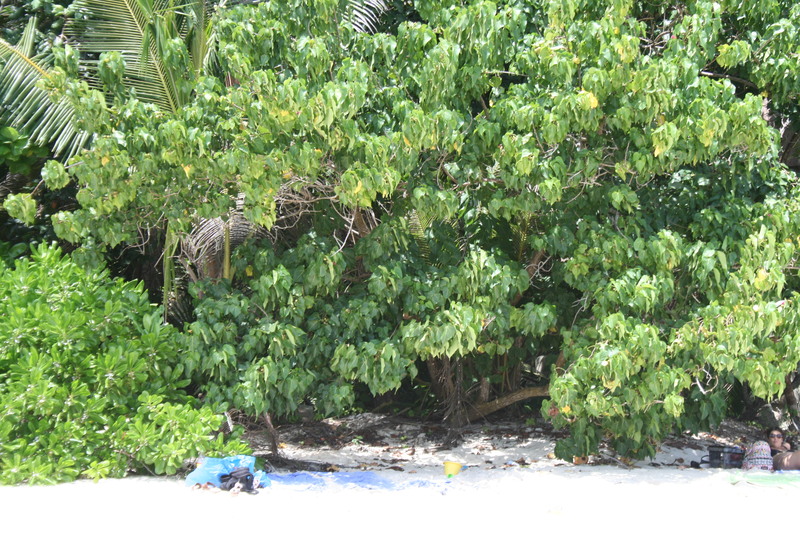 The trees overhang the beach and separates it into small caves. So cozy and in the shade we spent many hours there just relaxing, playing with the kids and talking. The only thing we missed was more bread. We would have loved to feed the fishes longer. 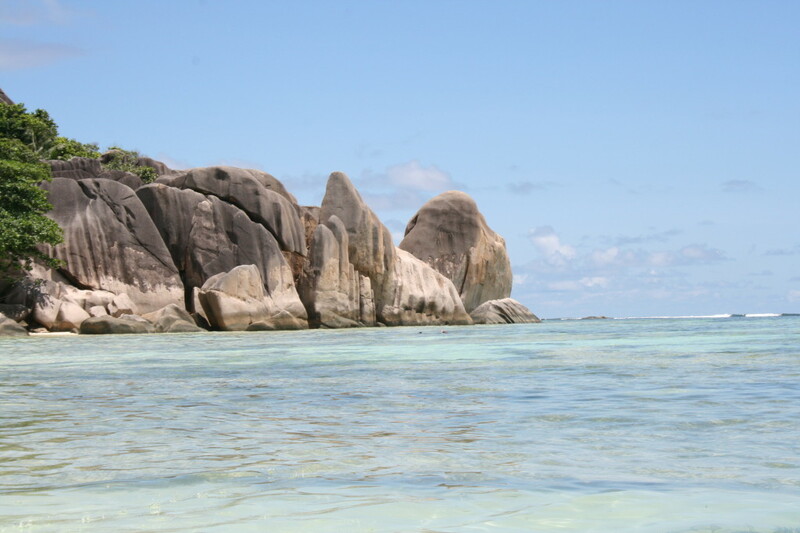 It was a perfect stay at Anse Source D’Argent on La Digue, Seychelles.